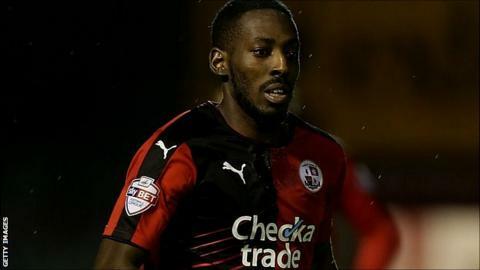 Roarie Deacon scored a last-minute winner as Crawley made it six wins from seven home games with victory over Stevenage in League Two. Crawley broke the deadlock when Matt Harrold helped on a throw from Lewis Young and Gwion Edwards fired home his sixth goal of the season from 12 yards. Michael Tonge equalised for Stevenage from the penalty spot after Josh Yorwerth hauled down Charlie Lee. Deacon had the final say with a last minute right-foot toe-poke to win it. "Obviously you want to win every game and we weren't at our very best today, but credit to the players they got a win and whether we deserved it is another matter. "Sometimes you have got to just stick at it, keep going and show some resolve and sprit, which can take us along way. "We worked a bit on set-pieces this week and its pleasing and it's all about the delivery - and if its there then we've got people who can get on the end of it. "There's lots of pleasing things and I want us to play better and I want us to excite the fans." Match ends, Crawley Town 2, Stevenage 1. Second Half ends, Crawley Town 2, Stevenage 1. Roarie Deacon (Crawley Town) is shown the yellow card. Roarie Deacon (Crawley Town) has gone down, but that's a dive. Roarie Deacon (Crawley Town) wins a free kick in the attacking half. Goal! Crawley Town 2, Stevenage 1. Roarie Deacon (Crawley Town) right footed shot from very close range to the centre of the goal. Assisted by Josh Yorwerth. Goal! Crawley Town 1, Stevenage 1. Michael Tonge (Stevenage) converts the penalty with a right footed shot to the centre of the goal. Josh Yorwerth (Crawley Town) is shown the yellow card for a bad foul. Penalty Stevenage. Jamille Matt draws a foul in the penalty area. Penalty conceded by Josh Yorwerth (Crawley Town) after a foul in the penalty area. Substitution, Crawley Town. Roarie Deacon replaces Matt Harrold. Ryan Johnson (Stevenage) wins a free kick on the left wing. Simon Walton (Crawley Town) is shown the yellow card for a bad foul. Foul by Simon Walton (Crawley Town). Attempt saved. Lee Barnard (Crawley Town) right footed shot from outside the box is saved in the centre of the goal. Substitution, Stevenage. Charlie Lee replaces Callum McFadzean. Attempt missed. Sonny Bradley (Crawley Town) right footed shot from the centre of the box is just a bit too high following a corner. Corner, Crawley Town. Conceded by Ryan Johnson. Foul by Jamille Matt (Stevenage). Simon Walton (Crawley Town) wins a free kick in the attacking half. Goal! Crawley Town 1, Stevenage 0. Gwion Edwards (Crawley Town) left footed shot from the centre of the box to the bottom left corner. Corner, Crawley Town. Conceded by Michael Tonge. Mitch Hancox (Crawley Town) wins a free kick in the defensive half. Attempt missed. Lee Barnard (Crawley Town) right footed shot from outside the box is high and wide to the right. Substitution, Stevenage. Jamille Matt replaces Armand Gnanduillet. Attempt missed. Michael Tonge (Stevenage) right footed shot from outside the box is close, but misses the top left corner from a direct free kick. Armand Gnanduillet (Stevenage) wins a free kick in the attacking half. Substitution, Crawley Town. Lee Barnard replaces Shamir Fenelon. Attempt missed. Mitch Hancox (Crawley Town) right footed shot from the centre of the box is close, but misses to the left. Foul by Rohdell Gordon (Stevenage). Matt Harrold (Crawley Town) wins a free kick in the attacking half. Attempt saved. Shamir Fenelon (Crawley Town) left footed shot from the left side of the box is saved in the top centre of the goal. Mark Hughes (Stevenage) wins a free kick in the attacking half.